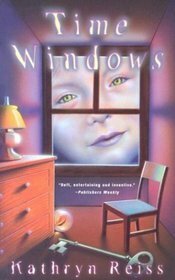 There are a whole slew of 2016 YA time travel books coming down the pipeline, and I actually got a few up at ALA midwinter, but it's still a bit aways from their publication dates, so I grabbed one of my TBR shelf at home for this week's Timeslip Tuesday--Time Windows, by Kathryn Reiss (1991). Miranda and her parents are excited to move into a big old house that's been sitting empty for ages, and she's pleased to find in the attic a lovely dollhouse that is a replica of the actual house. She looks into the house through its windows, and sees and hears former inhabitants of the real thing going about their lives! Miranda passes hours of each day watching their goings on, and learns that there are two families that keep appearing, one from the 19th century and one from the mid-20th century. The mother in the 19th-century family is beautiful but terribly cruel to her little girl, Dorothy. And (this is the scary part), the cruel-ness of that long ago mother is haunting the house. Miranda watches the mid-20th century mother get infected, changing from a gentle loving mama to a hateful abusive one and, even more horribly, she watches her own mother (who she calls Mither, which I didn't care for) start quoting practically verbatim the words of the first evil mother, and starting to behave just like her too. Miranda, with the help of the cute boy next door, finds the reason why the infection of maternal mother clings to the house, and things tilt somewhat to horror when she and the boy find out what happened to little Dorothy. It is rather creepy and horrible. Fortunately Miranda is able to use the magic of the dollhouse to set things right, and all the bad stuff with her mother gets overwritten with the good mother stuff that should have been there from the beginning. Final though--not bad, definitely creepy, probably won't ever re-read, though I bet I would have if I'd read it when I was 11 or so. gentleman who is caring for him? hmmm, that sounds so familiar...I wonder if it's Jane Louise Curry's Bassumtyte Treasure? The first thing that popped to mind was Winthrop's Castle in the Attic from 1985. The Reis book sounds all too creepy, a little like The Dollhouse Murders. Creepy dolls. Ugh! The girls who want books about abuse might like this, though! No idea on your reader's question. Time Windows sounds very creepy, but I do love the premise. Thanks for the review. Ah, Kathryn Reiss. She was one of my MFA teachers and I read a lot of her books from the 90's - this was super creepy. Thanks everyone for your input! This was my request...I have been trying for years to recall the title of this book. Bassumtyte Treasure could possibly be it..either way it sounds good, so I will try to get my hands on a copy. Hmmm...The mystery book sounds a bit like Time For Andrew: A Ghost Story, however that was published in 1994. It also sounds like Castle in the Attic, but I think the reader would remember in this story a miniature toy castle is the time travel portal.